By leveraging the Innovation Lab to collaborate with technological experts and ERT scientists who are dedicated to high quality safety and efficacy data capture, clinical researchers gain a resourcing and time advantage. ERT, the leading cloud platform solutions provider delivering clinical and scientific innovation through its patient-centric data collection and intelligence solutions, today announced the grand opening of its state-of-the-art Innovation Lab. Located in ERT’s Boston facility, the permanent Lab will open on Tuesday, February 9. ERT’s Innovation Lab is dedicated to creating new and efficient ways for pharmaceutical researchers to safely explore technological concepts with eClinical experts. Through collaboration with leading technology providers, pharmaceutical researchers, and ERT scientists, the Lab is developing and testing diverse technologies for use in clinical research, including new solutions for leveraging wearables, wireless medical devices and the Internet of Things within clinical trials. Following an irrefutable model based on lean development philosophies, the ERT Innovation Lab delivers results in weeks - not months, to support the rapid integration of new technological concepts into clinical development processes. Attendees of the Grand Opening will see demonstrations and displays of how today's technological advances can benefit clinical research, including Hexoskin®, a health monitoring smart shirt used to improve athletic performance and monitor vital statistics. 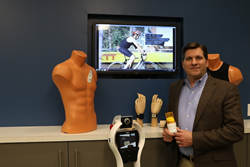 Once fully explored in the Innovation Lab, the Hexoskin smart shirt may prove beneficial for a wide range of clinical research uses, including sleep disorders, respiratory disease, and rehabilitative therapy. A Preview Innovation Tour and Luncheon for patient advocates to celebrate their collective successes in giving patients a greater voice in clinical research. A Grand Opening Reception for pharmaceutical researchers, technological experts, and media representatives featuring guided tours and hands-on demonstrations. The Innovation Lab Sweepstakes for pharmaceutical researchers to enter to win two weeks of innovation, valued at $20,000.00. No attendance is required. For additional information on ERT’s Innovation Lab and for details regarding Grand Opening events, visit https://www.ert.com/innovation-lab. ERT (http://www.ert.com) is a leading provider of high-quality patient safety and efficacy endpoint data collection solutions for use in clinical drug development. ERT delivers a combination of technology, services and clinical consulting that increase the accuracy and reliability of patient data and improve the widely deployed solutions in centralized Cardiac Safety, Respiratory, Suicide Risk Assessment, electronic Clinical Outcome Assessments (eCOA) – which includes patient-, clinician-, observer- and performance-reported outcomes – and cloud-based analytics and performance metrics. By efficiently integrating these solutions through a system built upon a scientific and regulatory foundation, ERT collects, analyzes and delivers safety and efficacy data critical to the approval, labeling and reimbursement of pharmaceutical products. ERT is a global organization with headquarters in Philadelphia, PA and offices throughout the U.S., and in Germany, Japan, Switzerland and the U.K.